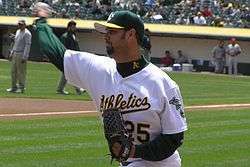 Esteban Antonio Loaiza [lo-EYE-sa] (born December 31, 1971) is a Mexican semi-retired baseball pitcher. He played for several teams and was the American League's starting pitcher in the 70th anniversary 2003 All-Star Game in Chicago. At a press conference in April 2016 Esteban Loaiza released to return to baseball in the Semi-Professional League Clemente Grijalva,in State of Sinaloa in Mexico leaving so his retirement, his debut will be in the team also former MLB RHP Luis Ayala in the team "Academy Chikote Ayala"
He married Jenni Rivera in 2010, and made several appearances on her family's reality television show, I Love Jenni. In October 2012, Rivera filed for divorce, citing "irreconcilable differences". On December 9, 2012, Rivera died in a plane crash before the divorce was finalized. A graduate of Mar Vista High School in Imperial Beach, California, Loaiza was signed by the Pittsburgh Pirates as an undrafted free agent on March 21, 1991. With the Gulf Coast Pirates in the Rookie leagues he started five games in 1991, finishing with a 5–1 record and a 2.26 ERA. He moved through the Pirates farm system with stops at Augusta (class A – 1992), Salem (class A – 1993) and Carolina (class AA – 1993-1994). He also played for the Mexico City Red Devils of the Mexican Summer League during the 1993 season. He has played with the Mexicali Aguilas of the Liga Mexicana Del Pacifico. Loaiza moved to a big league club in 1995, making his major league debut on April 29, 1995, for the Pirates against the Philadelphia Phillies. He worked 4 2⁄3 innings in the game, giving up five hits and one unearned run to achieve the first major league win of his career. He finished his rookie season with an 8–9 record and a 5.16 ERA in 31 starts. The Pirates traded him to the Texas Rangers on July 17, 1998, for Todd Van Poppel and Warren Morris. Traded again, to the Toronto Blue Jays by the Rangers on July 19, 2000 for Michael Young and Darwin Cubillán, he pitched with the Blue Jays through 2002. During the 2007 regular season, Loaiza spent a large amount of time on the disabled list due to spasms in his right trapezius. The A's activated him and moved him back to the 25-man roster on August 22, 2007. 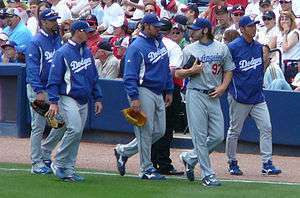 Loaiza (far left) with fellow Dodgers pitchers Scott Proctor, Jonathan Broxton, Joe Beimel and Takashi Saito in 2008. On June 14, 2006, Loaiza was arrested after being pulled over by police who clocked his Ferrari at 120 mph on a California freeway near San Lorenzo. He subsequently failed a sobriety test. He appeared in court on July 14, 2006. After the incident, GM Billy Beane banned alcohol in both the home and visitor clubhouse, citing liability issues. Loaiza was married to Mexican-American singer Jenni Rivera. The divorce papers were filed on Monday, October 1, 2012. The statement, released by Rivera's representatives, stated that the divorce was due to "irreconcilable differences on behalf of both parties derived from private circumstances that occurred during the lapse of their two-year marriage." Rivera died on December 9, 2012 when her private plane crashed, before the divorce was finalized. ↑ "Loaiza's Career stats on Yahoo! Sports"
↑ "Dodgers claim Loaiza off waivers from A's"